The four canonical Gospels of the New Testament were decided upon fairly early in fledgling church’s career to be the only acceptable Gospels. One scholar places the upper limit of the final dating for the four-fold Gospel Canon at around the year 150. Frederick C. Grant, The Gospels: Their Origin and Their Growth 13 (1983) . This is only an upper limit, and the Gospels were probably finalized much earlier; but even 150 is relatively early in church history. The Gospels necessarily had to be finished around that time: unwritten texts cannot be canonized, and the contemporary agreement of Irenaeus, Tertullian, and Clement of Alexandria was that the canonicity of the four Gospels was accepted by the end of the second century. Tatian, who was writing even slightly before Irenaeus and the others also held a view of four Gospels. This hints that Justin Martyr (ca. 150) also held this view, because Tatian was his disciple. Most interestingly, however, are the clues found in the Shepherd of Hermas, which point to the four-fold Gospels as well as serving as a source for some of Irenaeus’ later ideas on the subject. The church widely regarded the Gospels as having been written by apostles or their followers rather early; and these texts were canonized quite soon after they were all written. 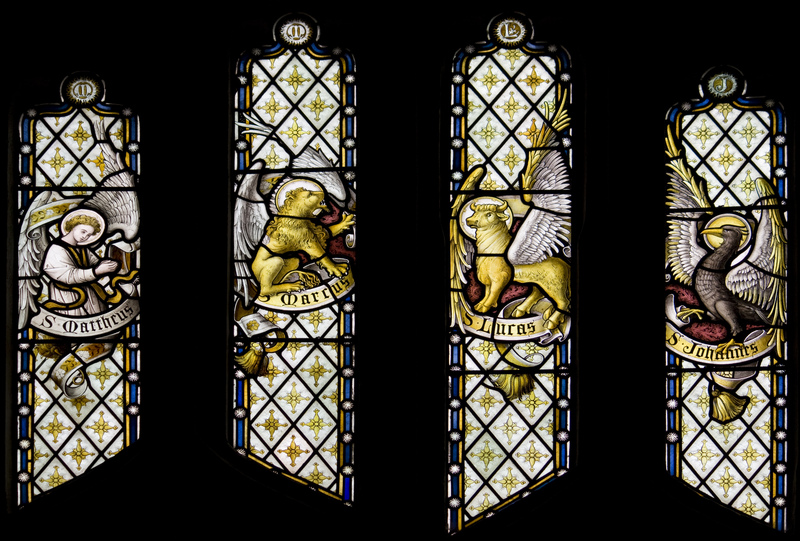 The Four Evangelists represented by their four symbols: Matthew, a winged man; Mark, a winged lion; Luke, a winged bull or ox; and John, an eagle. The church conceivably only needed one Gospel — four seems fairly arbitrary; the early church probably had some reason for selecting four Gospels. It is probable that the authors were perceived to have great authority, and “every one of these books was written, presumably, by an apostle or by a friend of the apostles.” Id. at 25. That a single authoritative Gospel existed in one community did not preclude the existence of other equally authoritative writings in other communities. Most likely the early church settled on four gospels (and more specifically these Four) because they were deemed to be the writings that held authority. The authorship of the Gospels would not have been a mystery to the early church. On the one hand, the Gospels are technically written anonymously. Sanders, The Historical Figure of Jesus, 57. Even so, their authorship would have been widely known or suspected and would have been subscribed almost immediately. 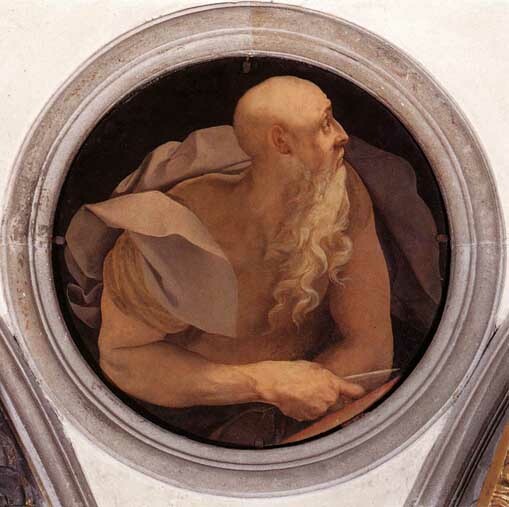 Papias was a companion of Polycarp, and Polycarp reputedly heard the discourses of the Apostle John firsthand. Irenaeus v. 88. 4 from Lightfoot, Essays on the Work Entitled Supernatural Religion 142 (1889). Writing as early as 125, but no later than 140, Papias mentions a tradition told to him by a mysterious figure he simply calls the Presbyter. This tradition holds that Mark, “the interpreter of Peter, wrote accurately, but not in order, the things either said or done by the Lord.” Papias, Exposition of the Dominical Oracles, preserved in Eusebius, Ecclesiastical History, 3.39 [quoted from NPNF-2 1.172-73]. The tradition passed down by the Presbyter and Papias is almost beyond doubt. Consider that if there were an attempt to falsify the authorship of Mark, then the obvious claim would have been to ascribe the Gospel to Peter himself rather than simply his interpreter. The Gospel would have earned much more authority if authored directly by the apostle. This is especially so given Peter’s high status even among the other apostles. Papias wrote confidently not only on the authorship of Mark, but also of Matthew. Papias tells us that Matthew was written in Hebrew by Matthew — (Papias’ use of Hebrew here is usually taken to mean Aramaic): “So then Matthew wrote the sayings in the Hebrew language, and every one interpreted them as he was able.” Papias, Exposition of the Dominical Oracles, preserved in Eusebius, Ecclesiastical History, 3.39 9 [quoted from NPNF-2 1.172-73]. By and large the New Testament was written originally in Greek, so this claim that Matthew was not first written in Greek stands in contrast to the rest of the New Testament texts. Indeed, one scholar, asserts that Matthew was not written in Aramaic but that the Nazarean sect translated Matthew into Aramaic, which survives today in fragments as the “Gospel of the Nazareans.” Ehrman, Lost Scriptures, 9. At any rate: “today scholars debate whether the church fathers were right in thinking that the Gospel of the Nazareans was an Aramaic version of Matthew.” Id. Given Papias’ testimony that Matthew originally wrote a Gospel in Aramaic (=”Hebrew”), it is probable that the Nazareans did possess an an original Aramaic version of Matthew. The early church was assured in its convictions concerning the Gospels’ authorship. Especially, since it is unlikely the orthodox would consider a Gospel whose author was unknown or doubtful to be canon. Justin Martyr, in a controversy tract, begins a point by first asserting: “in the memoirs which I say were drawn up by His apostles and those who followed them . . . ” Justin Martyr, Dialogue with Trypho 103 (ANF 1.251). If there were doubts as to the authorship of the Gospels then his argument employed to debate non-Christians would have held little weight. That Justin Martyr did not simply subscribe to these beliefs quietly but rather was comfortable using the authorship of the Gospels in arguments leads us to believe that not only is it likely that the early Christians agreed, but also their opponents did not object! Though Justin probably wrote around 160, the dialogue is intended to represent a conversation held around 135. Chadwick, The Early Church, 75. Undoubtedly, the Christians had accepted that the Gospels were written by apostles even earlier than this; since it is unlikely Justin Martyr simply came up with such a conclusion independently and expected to convince unbelievers with it. Irenaeus sets out the establishment of the four-fold Gospel clearly around 180: “It is impossible that the Gospels can be either more in number or, on the other hand, less than they are.” Adversus Haereses, 3.11.8 [quoted from Theron, Evidence of Tradition, 107]. The four-fold Gospel canon absolutely cannot be later than 180. Likewise, concerning the authority of the New Testament, Irenaeus was the first writer to unmistakably place an equal authority upon New Testament and the Hebrew Bible. Adversus Haereses, 4.9.1 [referenced from Kelly, Early Christian Doctrines, 56]. His argument for the four-fold Gospel relies on a philosophical concept concerning the four elements of the world: “For since there are four zones of the world in which we are, and also four principal winds . . .” Adversus Haereses, 3.11.8. The importance here lays in the fact that the orthodox by this time had unmistakably accepted these and only these Gospels. To Irenaeus these four Gospels were not only the sole authoritative ones, but he went so far as to claim that rejection of any one of them resulted in heresy. In the context of discussing the four Gospels, Irenaeus says: “If a person does not assent to these [doctrines], he surely rejects the followers of the Lord; he rejects even Christ the Lord himself; he rejects indeed also the Father and is self-condemned, resisting and fighting against his [own] salvation—which thing all the heretics do.” Adverus Haereses 3.1.1. It was not enough to regard a single Gospel as scripture to remain orthodox — an early Christian in Irenaeus’ time had to accept all four. For Irenaeus the issue was quantitative as well as a qualitative. Thousands of New Testament manuscripts have been discovered and more are discovered every year. The New Testament was largely originally written in the Koine Greek dialect — the common tongue of the Roman Empire. 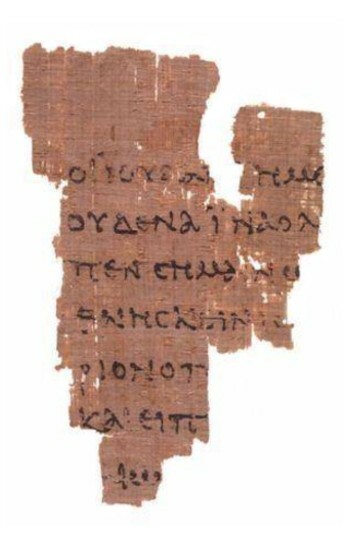 Papyrus 52 is the oldest discovered new testament manuscript. It contains several lines from the Gospel of John 18:31–33. Around the same time as Irenaeus, both Clement of Alexandria and Tertullian also indicate in their writings the widespread use of the four-fold canon of Gospel. Apparently Clement of Alexandria (ca. 190), had knowledge of a tradition (παράδοσις) concerning the ‘ecclesiastical canon.’ The Stromata, 6.7.61; 6,8,68; 6.15.131 [referenced from Kelly, Early Christian Doctrines, 43]. He also uses the phrase ‘New Testament,’ Id. at 56. He even mentions the authors of the Gospels by naming Mark and John. Eusebius, Ecclesiastical History, 6.14 [quoted from Theron, Evidence of Tradition, 45]. Likewise, Tertullian (ca. 210) stated: “What the apostles at first proclaimed by word of mouth, they afterwards . . . conveyed to us in scriptures.” Haer. 3.1.1 [referenced from Kelly, Early Christian Doctrines, 38]. He quoted from both the Hebrew Bible and New Testament without any difference in attributed authority. Marvin, Authorship of the Four Gospels, 20. He also had knowledge of and mentioned all four authors of the Gospels by name. Contra Marcionem, 4.2 [quoted from Theron, Evidence of Tradition, 45]. Judging by these three contemporary church fathers, the four Gospels were canonical by the end of the second century at the latest. Irenaeus, Clement of Alexandria, and Tertullian offer a temporal boundary for a study on the acceptance of the four-fold Gospel. Perhaps it was during their era that the church canonized the four gospels. Yet, earlier writers give less explicit, but nonetheless, compelling evidence for an earlier date of canonization. Tatian wrote only slightly earlier than these three church fathers; for example, 155 is an approximate date for Tatian’s Apology, although it is possible he wrote even earlier than this. Lightfoot, supra at 274. John’s Gospel is widely regarded to be the latest, and there is convincing evidence that Tatian knew of it and quotes it in his extant work. Compare Tatian’s: “God is a spirit (4),” to John’s: “God is a spirit (4:24);” Tatian’s: “The darkness comprehendeth not the light (13),” to John’s “The light shineth in the darkness, and the darkness comprehended it not (1:5);” and again, most compelling is the similarity between Tatian’s cosmogony: “All things have been made by Him, and apart from Him hath been made no one thing (19)” to John’s “All things were made through Him, and apart from Him was made no one thing (1:3).” Id. at 275. If Tatian knew of John, he certainly also knew of the earlier synoptic Gospels. Compellingly Eusebius writes that Tatian compiled a work known as the Diatessaron, which means in Greek ‘by way of four’ or ‘through four:’ the Gospel formed from the Four. “Accordingly their former leader, Tatian, compiling a kind of unification and combination of the Gospels—I know not how—entitled it The Diatessaron. It is extant with some even until this day. And they say that he dared to paraphrase some of the Apostle’s sayings, pretending to correct their syntax of language.” Eusebius, Ecclesiastical History, 4.29.6 [quoted from Theron, Evidence of Tradition, 41]. This work was apparently a combined version of the four Gospels, beginning with John’s. Lightfoot, supra at 283. However, the historicity of the Diatessaron has been questioned by modern scholars as it is no longer extant. Id. at 277. John the Apostle was the only apostle not to suffer a martyr’s death, so he is variously portrayed as both young or old in art. He was known as the apostle “whom Jesus loved.” The Gospel of John stands in contrast to the synoptic gospels. It is widely regarded as the latest gospel because it evidences a much more developed theological conception of Jesus as divine. This Gospel also hints much more than the others as to the severance between the Judaic community and early Christian community (which had its start as just another Jewish sect). Tatian surely received the idea of a four-fold Gospel as a tradition from Justin. While, Justin never unequivocally uses the phrase New Testament or names the four Gospels as Tertullian, Irenaeus, and Clement did, he was definitely familiar with Gospels. Kelly, Early Christian Doctrine 58. To writers such as Clement of Rome (ca. 95), Barnabas (ca. 100), and Justin Martyr ‘scripture’ referred to the Jewish collection of writings. These writings were given the authoritative phrase ‘it is written’ when quoted, and Jesus uses this formula often in the Gospels when quoting them. Yet, concerning early Christian practices Justin wrote: “On the day which is called the Sun’s Day there is an assembly of all who live in the towns or the country; and the memoirs of the Apostles or the writings of the prophets are read.” Justin, 67 (Bettenson’s translation, Early Christian Fathers, 62). In their church meetings, Justin and those at Rome afforded to the Gospels an equal amount of honor as they did the ‘scriptures’ of the Jewish religion. A transition was occurring (or had occurred) by the time of Justin in which the authority of the New Testament writings was being realized. Justin never uses the actual word ‘Gospel,’ but it’s clear that this is what is meant by ‘memoirs of the Apostles.’ Neither does he offer any names as to their authorship, yet, certainly, Justin and his church held the Gospels to be the actual memoirs written by apostles. So by the time of Justin (i.e. ca. 130-160) the Gospels were in circulation and were being treated basically as scripture; it is highly likely that Tatian’s Diatessaron was not an innovative except to combine the Four. The date for the The Shepherd of Hermas is important as it is perhaps the oldest evidence for the orthodox church’s four-fold Gospel. This writing is found listed in the Muratorian Canon of the late second century: “Hermas composed the Shepherd quite recently in our times in the city of Rome, while his brother, Pius, the bishop, occupied the [episcopal] seat of the city of Rome.” The Canon then goes on to claim that the writing should be read, but is not deserving of a position among the Apostles or Prophets. Theron, Evidence of Tradition 113. This statement allows a date to be set for the writing. Pius was bishop at the earliest around 140 if Eusebius’ account is faithful. Eusebius, The History of the Church 4.11. He is said to have died fifteen years after taking office. Likely, then, he and his brother would have been nearing the end of their lives as this period approached. Pius’ chronology does not cement any dates for his alleged brother. Even so, The Shepherd of Hermas was likely not written much later than 140, and possibly could have been earlier depending on how long one would concede these men to have lived. It would not be impossible for the author to have written parts of The Shepherd in midlife and then added more before dying around forty or fifty years later. This speculation has some support. There was evidently a Christian named Hermas living in Rome whom Paul greeted in his letter to the Romans. “Greet Asyncritus, Phlegon, Hermes, Patrobas, Hermas and the brothers with them.” (Romans 16:14: NIV). Similarly, in the second vision of Hermas there is found an interesting statement: “You will write two books, and send one to Clement and one to Grapte. Clement will send it to the foreign cities, because it is permitted to him so to do.” The Shepherd of Hermas, Vision 2.4.2 (ANF 2.12). Hermas’ mention of a Clement is likely the same Clement who authored the epistle to Corinth around 95. Wilson, The Career of the Prophet Hermas, 22. This reference leads to a conclusion that Hermas was active in Rome far earlier than 140. Clement is described as possessing some form of authority as opposed to Grapte, and this authority leads one to concur that it was not simply a coincidental occurrence of the name. Likewise, in the same passage, Hermas describes writing two books. This is possibly because he wrote sometime during his youth, and again as an older man wrote more or edited his previous writings. 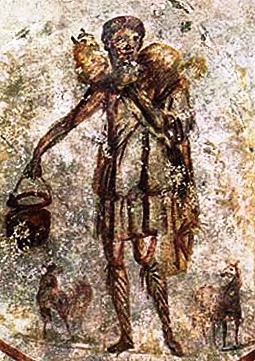 This image of the “Good Shepherd” comes from the catacombs of Rome. The Shepherd of Hermas is an early Christian work that was regarded by some early church fathers as canonical. For, just as when some Good News comes suddenly to one who is sad, immediately he forgets his former sorrows, and looks for nothing else than the Good News which he has heard, and for the future is made strong for good, and his spirit is renewed on account of the joy which he has received; so ye also have received the renewal of your spirits by seeing these good things. As to your seeing her sitting on a seat, that means that her position is one of strength, for a seat has four feet and stands firmly. For the world also is kept together by means of four elements. Hermas, The Shepherd, Vis 3.13.2 (ANF 2.17). Hermas is comparing some four-fold basis for the church to the four elements of the world; which will be repeated a few decades later by Irenaeus about the four Gospels in a less implicit manner. Taylor, The Witness of Hermas, 6. Therefore, Irenaeus seems to have been influenced by Hermas concerning the four-fold Gospel due to the similarity in his own tradition in which he compares the four Gospels to the four elements. Similarly, “Irenaeus knew The Shepherd and quoted it as ‘scripture.’” Taylor, Hermas and the Four Gospels 201. Whether The Shepherd of Hermas was written ca. 100 around the time of Clement’s letter to the Corinthians is not certain. Yet, the question as to whether Hermas describes a four-fold Gospel seems more certain. If he wrote as early as the late first century, then the dates of the Gospels are necessarily older. Even if The Shepherd is assigned to around 140 as The Muratorian Canon could indicate, it is still likely that this is the first written account of the four-fold Gospel; not only did Hermas know of all four Gospels by 140 at the latest, but also considered them to be the solely authoritative ones. If, then, any one came, who had been a follower of the elders, I questioned him in regard to the words of the elders,—what Andrew or what Peter said, or what was said by Philip, or by Thomas, or by James, or by John, or by Matthew, or by any other of the disciples of the Lord, and what things Aristion and the presbyter John, the disciples of the Lord, say. For I did not think that what was to be gotten from the books would profit me as much as what came from the living and abiding voice. Papias, Exposition of the Dominical Oracles, preserved in Eusebius, Ecclesiastical History, 3.39 4 [quoted from NPNF-2 1.172-73]. Some scholars interpret this passage to mean that Papias was “expressing a uniform preference for oral as against written tradition” and was completely uninterested in literary accounts. Walls, “Papias and Oral Tradition,” 137. Yet, he simply seems to be saying he preferred oral accounts for analysis. By the end of the second century, the concept of the four-fold Gospel among the church fathers was understood. Working backwards in time from this position, Tatian around 160 apparently also held this opinion. Plausibly his teacher Justin around 150 held this position. Finally, Hermas between 100 and 140 was apparently a source of Irenaeus’ opinion on the four-fold Gospel. Therefore, the date of the four-fold Gospel is probably older than the first undeniable claimants to this view in the late second-century. It is likely that the Gospels were written at least as early as the beginning of the second-century if not during the first. I agree Tatian may have had acesss to material found in John and possibly that book. But Justin in his writings was totally unaware of any book ascribed to John other than Revelation . Justin was a worshiper of Plato and Philo which the prologue was without a doubt was drawn from. I think Justijn compiled sayings and events from the memiors of the Apostles ,a single book and added his platonic thought to create his very own gospel who he claimed come from John and Tatian was the first one fooled by Justin. It possible the epistles were used or penned by Justin as a witness.